XAT Previous Year Question Papers Answers and Solution 2005 to 2018 [PDF]. We have more than 10 years of XAT or Xavier Aptitude Test question papers with answers and some of them have a solution. As matter of fact, you probably hardly find these number of XAT past papers in online. We are one of the oldest people providing XAT Previous Year Question papers with answers keys in online for free. There are main four sections in XAT question papers Verbal & Logical Ability, Decision Making, Quantitative Ability & DI, and General Awareness. However, the question pattern is different from CAT, to score well in XAT exam it is essential that the candidates take as many XAT mock tests as possible and also solve the XAT previous year papers. Even candidates may also check our MBA Entrance Mock Test. 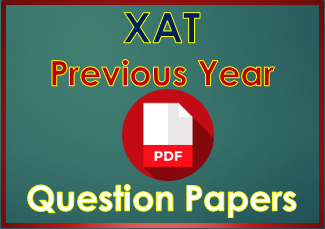 Every year the authority of XAT publish model question paper, However, his model only indicates a general pattern of questions that may be asked in XAT 2019. These are only indicative in nature and the questions in the Test may or may not be on the same lines. The test may have multiple sections, to evaluate the candidate’s quantitative, qualitative, verbal, data interpretive and decision-making abilities. Wrong questions may carry negative marks. Previously we used to have a registration form to download the question papers. But now candidates may download these past papers without any registration or signup. We have uploaded these papers in a PDF file. Students just need to click on the download link and save the file into their device.